The core of the DETEXI network video management system — Network Video Recorder. 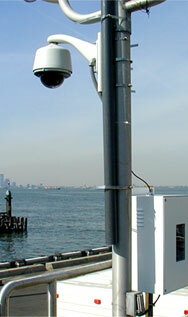 The DETEXI NVR supplies the basis for video management, monitoring, analysis, and recording. The NVR video management enables multiple users to view several different cameras at the same time (DETEXI Client) and allows recording to take place simultaneously. The NVR video motion detection defines activity by analyzing data and differences in a series of images (areas of interest can be defined) providing VMD functionality to network cameras or video encoders that do not originally embed this feature. This alleviates the workload for any recording devices in the system and makes event-driven surveillance possible. The NVR provides several recording modes: manual, scheduled (with or without motion detection), on alarm, and on motion detection only. The NVR video management allows users to administer and manage cameras from a single interface: managing IP addresses and setting resolution, compression, and security levels. The NVR supports remote access to the system configuration information (users, cameras, schedules, motion settings, tasks) and recorded video (storing in the NVR Archive) via DETEXI Client software. Provides multiple search functions for recorded video. The NVR allows control of PTZ and dome cameras via mouse that is controlled by an operator in the DETEXI Client, or it can be done automatically via guard tours and sequences controlled by the software. The NVR supports configuration of I/Os: enables video to be sent and recorded, and alarms to be sent in response to external sensors. This allows remote monitoring stations (Remote DETEXI Clients) to become immediately aware of a change in a monitored environment. The NVR provides alarm management: the software can sound an alarm, display pop up windows with alarm video stream, send e-mails, or call a phone and play alarm-specific WAV file or text-to-speech message. The NVR also provides full duplex real-time audio support, for either live or recorded audio. The DETEXI NVR installed on a standard Windows PC server comes with recording and viewing functionalities as well as functionalities for configuring network video devices. Includes event handling and security; video motion detection and other video intelligence as well as integration with other systems such as access control and building management. Based on a Windows DETEXI Client provides for live video/audio viewing, cameras control and search/playback archived video functionality. All system settings are inherited and downloaded from the NVR. A background service in Windows, DETEXI NVR will start automatically upon system start-up and continue running even after the user logs out. DETEXI is a self-contained package, so there are no plug-ins, downloads or players to install. All dialogs that allow control and configuration of all aspects of the DETEXI NVR are found under the NVR Control Center — the NVR graphic user interface. The DETEXI NVR can be considered as an intelligent storage and authentication server for the Remote DETEXI Clients with virtually unlimited number of IP video/audio suppliers (such as IP-cameras and video servers) logically attached to it. Any attached device can be used by the NVR. Video/audio source or source of the remote event (motion events or remote I/O port events) are examples of attached devices. The underlying structure of the DETEXI NVR software consists of many individual services, which allow execute and organize all the tasks it is responsible for. The services are registered with Windows as Services; some are configured as automatic by default. The DETEXI NVR software consists of different modules/services, which allow execute and organize all the tasks it is responsible for. The services are registered with Windows as Services; some are configured as automatic by default. All NVR services are visible and configurable in the NVR Control Center — Monitor. In the default setup the DETEXI NVR is working in an unattended mode, this means it is up to the local administrator to check the status of the programs and related hardware manually. However, in most cases a PC Server accommodating the DETEXI software is in a remote location with no local human interaction, therefore a designated person or persons should be aware of the DETEXI NVR status at any given time. You may not need the recorded video for weeks or even months, but if something happened (camera failure, power failure, network failure etc.) during that time it is possible that the NVR does not have some or any recorded video at all and the required evidence may be lost. The NVR services could fail due to unforeseen events and therefore must be monitored and controlled. To monitor the health of the NVR services you need to assign a predefined task that will be executed in a case of failure to each service you wish to monitor. For more information, refer to the Administration and Management — Reliability System section. Learning the NVR event management system should allow a better understanding of how to configure system settings including system health monitoring. All NVR services are visible and configurable in the NVR Control Center — Monitor. To setup NVR Services health monitoring you need to assign a predifined task that will be executed in a case of failure to each service you wish to monitor. Press Health monitor On/Off button in the bottom right corner — the No answer task panel appears. To assign a task to a service select previously created task from the drop-down list next to the component. Assign a task to each service. If properly configured, service failure will be detected within 3 minutes and the assigned task will be executed. To learn more refer to the Administration and Management — NVR Control Center — Service Status section.